12/1/15 Jones offers to pay Ben Matus to drop out of the race for County Commissioner Pct. 3. Jones said he was just trying to do the right thing. Later interviews tell a different story. I don’t think it was revealed that a Grand Jury recommended the investigation. Recently, information regarding McLennan County Commissioner Precinct 3, Will Jones and his Administrative Assistant, Susanne Nemmer was brought to my attention. It is the recommendation of a current McLennan County Grand Jury that the following information be provided to the Texas Rangers for further investigation, if needed. This document is interesting because this is the first time the Anti-bribery statement comes up. That’s important later. Interesting that the author states they fear retribution. The really important thing to note here is how many people signed off on the recommendation. Note that each signature includes a note with the Ranger Chief approving the investigation. Couple of things about the interview. Jones says he did it to save money. He also said his wife, an attorney, was involved in the decision. Jones, in his own words estimates he would save $40,000.00 if Matus dropped out. Listen to the statement about the District Attorney. Sounds like he believes the DA will fix it for him. No motion to recuse 54th District Court Judge Matt Johnson has been found. While odd, the motion by the District Attorney addresses the issue. It is interesting because it says Jones was concerned by the recusal of the local judge. Although the undersigned is not disqualified to act in this matter as a matter of law, it would be in the best interest of justice and society to appoint an attorney pro tern because the Defendant is a County Commissioner for Precinct 3 in McLennan County, Texas and votes on budgetary and human resource matters brought before the Commissioner’s Court by the District Attorney’s Office. There have been a couple anonymous phone calls to my office from McLennan County citizens expressing their concerns with Commissioner Jones. The rumor “around town” is Jones’ attorneys are going to get him off on a Misdemeanor, and Jones still feels like he did nothing wrong. The citizens feel like “politics” won again as Jones will go unpunished or the offense will be lessened. The callers are also upset about Jones intentionally swearing into office and signing certain forms. Thinking those certain forms are the Anti-Bribery Statement. Why be obtuse if it was no issue? Never see a black man charged by information. Extra preferential treatment. Normal people just have a warrant issued and the police pick them up and put them in jail. This is so convoluted it took a while to figure out what happened. Nothing really interesting here. Normally it is a $2,000.00 bond for a Class A misdemeanor. As I mentioned in our earlier meeting, as part of the deal Mr. Jones cannot plead no contest. Apparently his attorney asked about pleading no contest and also asked about pre-trial intervention. 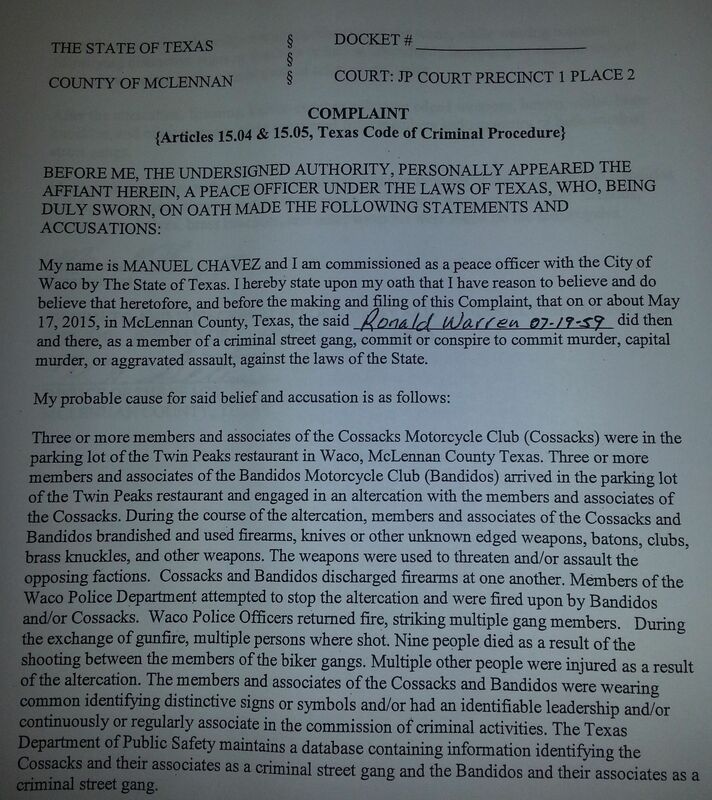 This is a criminal complaint filed with the Ranger who forwarded it to the AG. The date is important and the complaint is the basis for complaints later found by a magistrate to be probable cause to support a warrant. As a result of this complaint, the AG called complainant and said they had looked at every aspect of possible charges and the engaging in organized criminal activity statute only applied to street gangs. It is interesting that there was never a response to this email and it was not furnished in response to a public information at request. Compare to Twin Peaks warrant. The powers that be lost it for a couple of reasons. Decide for yourself. 1. Everyone assumed only a police officer could file a complaint. 2. Everyone assumed only a local magistrate could make a probable cause determination. Neither assumption is true but if it was true, it would make it much easier to take care of special people and cover up illegal activity. This is where it gets predictably interesting. Gates, who was fired from the local Sheriff’s office, came to him this morning and gave him a copy of a complaint against Will Jones. Gates left the Sheriff’s Office over a decade ago and was not fired. This is a blatant lie and attempt to deceive the AG. Since this is an issue that we discussed and everyone looked at, I felt you should be made aware. This is interesting. Now the question is, did the AG authorize Jones to commit a felony offense because they were sure they were the only people who could prosecute the offense. Did the AG allow him to commit a felony so he would enter a plea to a lesser, earlier offense? They did discuss it and were aware of the issue March 2nd 2016. Also please let me know if they actually try to arrest Mr. Jones. District Judge Judge Strother in Waco is going to consider the arrest of Will Jones in relation to 15.17d of the Code of Criminal Procedure. Art. 15.17. DUTIES OF ARRESTING OFFICER AND MAGISTRATE. (d) If a magistrate determines that a person brought before the magistrate after an arrest authorized by Article 14.051 of this code was arrested unlawfully, the magistrate shall release the person from custody. Art. 14.051. ARREST BY PEACE OFFICER FROM OTHER JURISDICTION. (a) A peace officer commissioned and authorized by another state to make arrests for felonies who is in fresh pursuit of a person for the purpose of arresting that person for a felony may continue the pursuit into this state and arrest the person. (b) In this article, “fresh pursuit” means a pursuit without unreasonable delay by a peace officer of a person the officer reasonably suspects has committed a felony. So Strother used a statute written for out of state police officers to dismiss charges. The statute provides a means for and out of State office in fresh pursuit of a felon to make an arrest in Texas. Here, not only was there no fresh pursuit, there was no out of state police officer. It was a warrant. The AG was aware but no objection noted in response to a public information act request. Remember this part from 8/10/16? I am told that the McLennan County Assistant DA Michael Jarrett will be there for the State. This is supposed to be at 10:00am this morning. The DA has not recused at this point, but I still felt it important to advise you. Please consider the recusal of the DA was approved by a judge. The AG was aware of the recusal. The defense was aware of the recusal. You have to wonder how all of a sudden it was no longer in the interest of justice and society. We reiterate that the affidavit does not have to establish the suspect’s guilt beyond a reasonable doubt or by a preponderance of the evidence. As you can see above, they abandoned this plan. You have to wonder why. Did Strother step up to “Fix” it. Did Strother/DA/AG hatch a plan to “Help a brother out”? Why indeed? They could have run it by the Grand Jury who could of no-billed the charge. They didn’t and I think it is important to know why they chose to use a statute that was not applicable to to make two felony charges against the Commissioner go away. Strother says he has made the request before. No records exist of him making the request in the past. Strother says he will allow the other Judges to make their case for raises. Later revealed he was making request for all staff of all District Courts. Strother appears to take the position these are not judicial records but are court records not subject to Rule 12. The question a reasonable person would ask is, was there any doubt in the mind of the court what information was requested. If there was no doubt, why not make the information available? Why indeed? 8/10/17 Public hearing on the tax rate. The hearing is required by law. The County Judge believes 2-3 minutes is adequate to address a $100,000,000.00 budget.